After receiving a rejection letter from the University of Michigan this Spring, high school senior Brooke Kimbrough decided to stage a protest of the college's admissions practices. Kimbrough held a news conference and rally at the university where she said she is fighting for fair minority representation within the student body. Less than 5% of the students are Black. Kimbrough says she carried a 3.6 GPA and scored a 23 out of 36 on the ACT standardized test. She applied through U-M's early action program and was given a deferred admission decision prior to her subsequent denial. The Michigan Daily notes that her scores are below average when compared to the university's fall 2013 class, which achieved an average GPA of a 3.85 and an average ACT score range of 29 to 33. U-M is currently ranked 28th among national universities in the U.S. News & World Report Best Colleges list. The high school senior points to her achievements outside of the classroom: she's part of University Prep's award-winning debate team, president of the school's National Honor Society chapter, and took part in a youth leadership program at Alternatives for Girls, a Detroit nonprofit. Kimbrough is backed by the civil rights activist group By Any Means Necessary (BAMN). 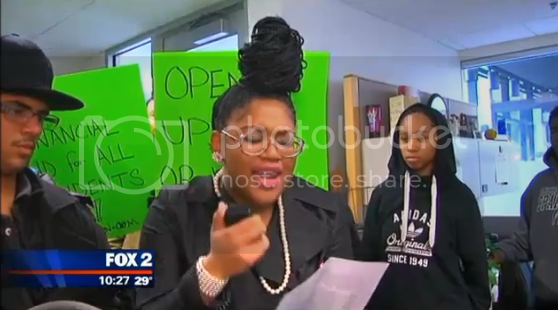 Three other Metro Detroit students also attended the news conference and protest to share their stories. What do you think of Brooke's mission?